Showcasign Teardrop XL. Originally developed by Nathan Allan Glass Studios Inc, our Freeform Collection line of Teardrop textures, are a reflection of our continued innovation success. Being the first to create unique, decorative glass, is a source of pride as we show the glass industry how the boundaries are stretched and often completely recreated. Scintillating with softly contoured facets, the bejeweled Teardrop Glass joins our popular Freeform Collection, a collection of lofty depth dimensional patterns, but without texture. This is a first in the kiln formed glass industry, and the texture less patterns allows for far greater light transmission and clarity, without sacrificing privacy. 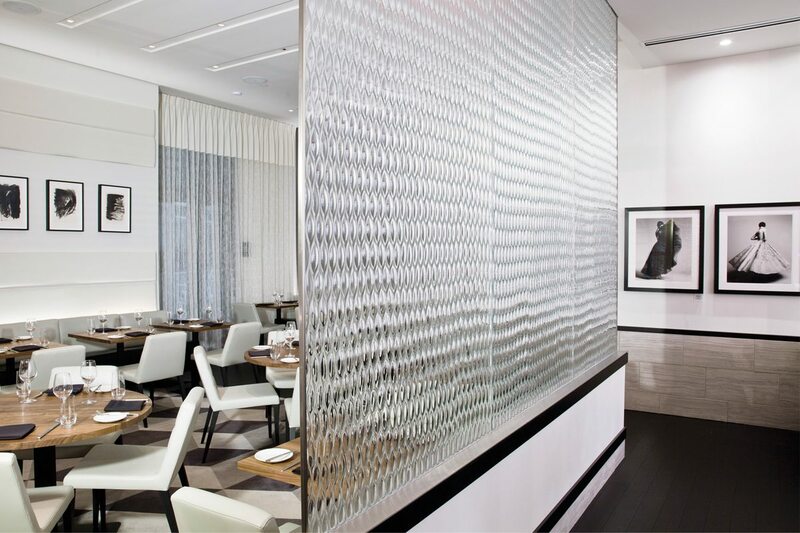 Viewable from either side, Teardrop textures are ideal for partition openings where a bold statement is required. Available in Teardrop, Teardrop XL and Teardrop Grande.